Director – J.A. Bayona, Screenplay – Derek Connolly & Colin Trevorrow, Producers – Belen Atienza, Patrick Crowley & Frank Marshall, Photography (3D) – Oscar Faura, Music – Michael Giacchino, Visual Effects Supervisors – David Vickery & Alex Wuttke, Animation Supervisors – Glen McIntosh & Jance Rubinchik, Visual Effects – Industrial Light and Magic (Supervisors – Alex Wang), Special Effects Supervisor – Paul Corbould, Creature Effects Supervisor – Ken Scanlan, Makeup/Prosthetics Supervisor – Karen Cohen, Production Design – Andy Nicholson. Production Company – Universal/Amblin Entertainment/Legendary Pictures/Perfect World Pictures. Isla Nubar is facing an impending volcanic eruption. The US Senate holds hearings but declines to take any action to save the dinosaurs. Claire Dearing now heads an NGO that is trying to raise capital the mount a rescue of the dinosaurs. She receives an offer from John Hammond’s former business partner Benjamin Lockwood to join a team to conduct her rescue mission. To do so, she has to recruit Owen Grady, which means reconnecting with him after the two split up over her unwillingness to join him in going and living in a caravan. The team arrive on the island and reactivate the security grid. However, as soon as the dinosaurs are gathered, Lockwood’s mercenaries set sail, abandoning Owen and Claire. Sneaking aboard the ship just before the island is destroyed by the eruption, Owen and Claire travel back to Lockwood’s estate where they discover plans to further genetically engineer the dinosaurs. Fallen Kingdom was the fifth of the Jurassic Park films. Steven Spielberg’s original Jurassic Park (1993) was a sensation, the peak of effects technology in its day and a massive box-office success and audience favourite. Spielberg directed a weak sequel with The Lost World: Jurassic Park (1997) and oversaw the passably forgettable Jurassic Park III (2001). Though rumours of a Jurassic Park 4 circulated for more than a decade, nothing emerged for another fourteen years until Jurassic World (2015), which promptly became a massive hit again (the second top-grossing film of 2015). Fallen Kingdom is a direct sequel to Jurassic World that reunites that film’s two stars Chris Pratt and Bryce Dallas Howard, as well as brings back Jeff Goldblum, who we have not seen in the series since The Lost World. Colin Trevorrow, the director of Jurassic World, bowed out of returning and signed on to direct Star Wars IX (2019) only to be unceremoniously dumped from that after the critical drubbing taken by his small independent film The Book of Henry (2017). While Trevorrow and his regular writer Derek Connolly do turn in the script here, directing duties have been inherited by Spanish director J.A. Bayona who first appeared with the ghost story The Orphanage (2007) and received acclaim for his English-language debut with the tsunami drama The Impossible (2013) and the dark children’s fantasy A Monster Calls (2016). Jurassic World was not a great film but proved enjoyable popcorn fodder; by contrast, Jurassic World: Fallen Kingdom slots into being an entirely by-the-numbers sequel. Industrial Light and Magic do their usual top-quality job and produce an impressive array of dinosaurs but nothing that be considered new. Usually, the Jurassic Park films have at least one standout effects set-piece that you remember afterwards but the sequences here, while perfectly technically competent, are forgettable. 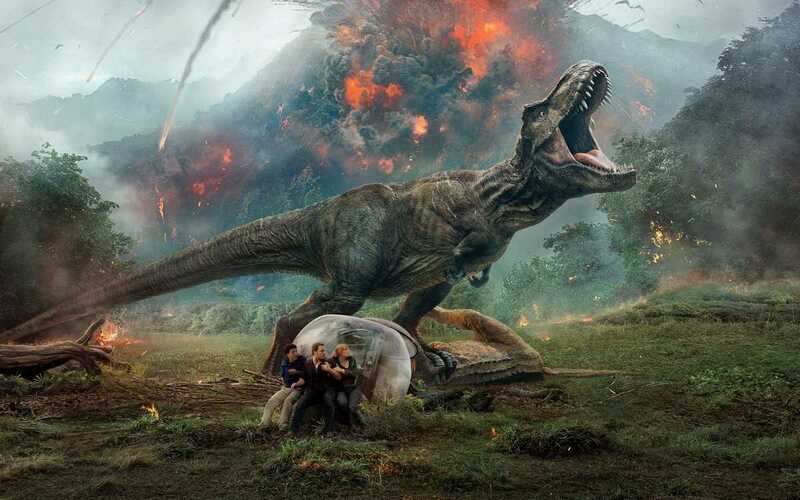 The one that stands out somewhat is where Bryce Dallas Howard and Justice Smith are trapped in one of the glass balls by stampeding dinosaurs fleeing the volcanic eruption and knocked over the cliff where Chris Owens has to dive in to rescue them as the ball floods. At other times – the climactic scenes with the Indoraptor invading the child’s bedroom and atop a Victorian conservatory – it seems that J.A. Bayona has travelled far more inside Gothic horror than any of the other Jurassic Park films do. In truth though, the Jurassic Park series feels creatively worn out of ideas and to be stuck just repeating the same things with minute variation. About the only new thing the script comes up with is the idea of genetically splicing the Indomitus from the previous film together with a velociraptor – something that only produces an indifferent shrug of the shoulders in terms of adding any new cards to the deck. Much of the plot feels like it consists of elements recycled from The Lost World – holdovers from the previous film recruited to go on a rescue mission back to the island; their being placed in peril due to treacherous mercenaries; even the ending where the dinosaurs are allowed to roam free in civilisation and the cautious upbeat note of conservation of species. (Certainly, the end speech where Jeff Goldblum spells out that this means that humanity and dinosaurs are now going to have to learn to co-exist makes for challenging possibilities for any further sequel). The rest of the show feels written in lazy, easy arcs – the romantic reconciliation, which has its entire plot arc spelt out for it from the first scene where the two characters meet up again; the fact that something is different about the kid being unsubtly denoted from the first time we meet her; the too-good-to-be-believable offer to rescue the dinosaurs and so on.